Cherie Em’s products are intimately created and delicately blended for a sensory experience. Welcome to Cherie Em. We are manufacturers of beautiful, artisan, botanical bath & body products, gentle face products and botanical, all natural perfumes. Our products are a story that is inspired by centuries old French perfumery & apothecary techniques and the myriad of natural sources that nature has to offer. Our gifts are wrapped like a gift you’d give your best friend. 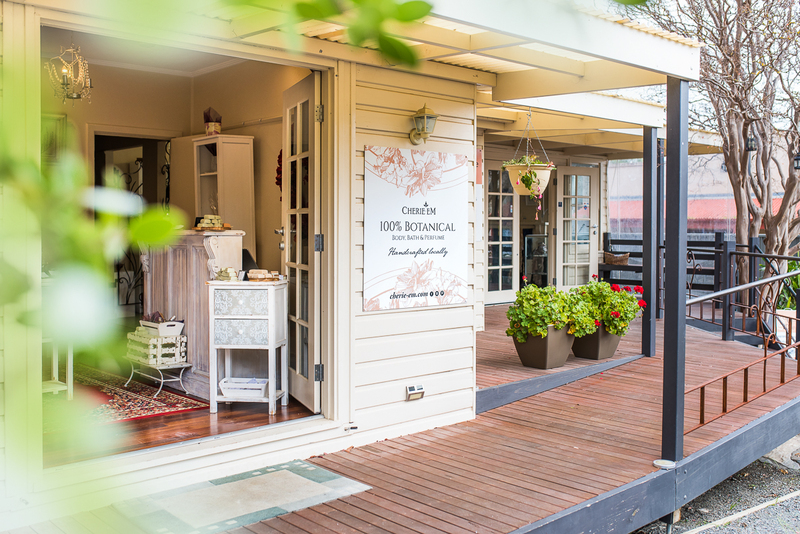 Cherie Em manufactures in the beautiful town of McLaren Vale, South Australia. All batches are lovingly and carefully hand made in small batches using only organic, natural and fair trade ingredients that are sustainably and ethically sourced and are cruelty free. Presently we are operating at 69 Jetty Road Brighton and 20 High Street, Willunga. Click here for opening hours of both stores. A selection of our products are also available at the following stockists. Our intention at Cherie Em is to be a world class manufacturer of bath and body products and perfumes using only 100% botanical ingredients and minimum 90% certified organic ingredients where possible. We aim to inspire with the creative use of nature’s beautiful raw materials. The amazing products of Cherie Em contain no synthetic ingredients or fragrances, no colorants, no animal ingredients and no phtlates, sulfates or parabens. They DO contain 100% botanical raw materials and essences only, leaving them easy to wear and use by all users of Cherie Em products. At Cherie Em we are forever grateful for the gifts of nature. The wonder and awe at the vast array of raw botanical materials available, the possibilities of the combinations of ingredients are endless. It is our dream that when people use Cherie Em products that they have and an innate feeling of well-being, luxury and indulgence and an appreciation for the quality, botanical & organic ingredients used. Cherie Em’s products are hand made solely by Cherie (pictured below) and commenced operations in September 2012. As the business is growing Cherie is starting to train her mum and daughter who are equally passionate about botanical products. Prior to that Cherie had extensive experience hand making similar types of products. She has undertaken numerous studies over the last 15 years in French Perfumery techniques, Natural Perfumery, Natural Skin Care Manufacturing, Aromatherapy, Soap Making, Candle Making plus much more. Your Exquisite Skin is the veil to your beautiful shape. It wraps and protects. Cherie Em uses only Precious natural and organic ingredients to nurture your beautiful self. At Cherie Em we understand that great skin starts with a botanical skin care regime and holistic lifestyle choices, good diet with plenty of fresh produce, exercise and keeping stress under control. Our botanical skin care regime will leave your skin feeling soft and nourished without the use of harsh ingredients. Where possible we use organic ingredients and in all our face & body products aim for a minimum of 90% certified organic ingredients. No animal products are used and all products are Vegan friendly, Only natural preservatives are used and we never use sulfates, phtlates, parabens and any other nasty ingredients. Natural fragrances. Our products are naturally fragranced using beautiful aromatics direct from nature. Essential Oils, Absolutes, CO2 Extractions, Resins are extracted using the gentlest of methods. No animal products are used. Plus many more botanical & organic ingredients. Aromatic ingredients that deliver natural luxuriance. At Cherie Em we are passionate about reviving the lost art of Botanical Perfumery. Perfumery in the 20th Century was replaced with synthetics and mass marketed products. Botanical perfumery is an ancient practice which uses only natural aromatics. The subtleness of a botanical perfume ensures that you do no overpower any room that you walk into. It is akin to having your own private scent veil which is smelt by you and those who embrace you. What is natural perfumery? Natural perfumery dates back to Ancient Babylon and Egypt right up to the turn of the 20th Century. The French were famous for introducing different notes into perfumery (much like musical notes as discussed further below). At the end of the 19th Century and the turn of the 20th Century, synthetic ingredients were introduced. These synthetic ingredients allowed perfumes to become produced in much larger quantities than their natural counterparts. Natural Perfumery is the creation of fragrant perfumes from entirely botanical ingredients such as flowers, citrus, resins, woods, barks. Natural perfumery is also an art and the blending of the natural ingredients to create a perfume. Many believe that you need to be a scientist to study perfumery but some say that can hinder the intuition of the art of blending. Natural perfumery is an ancient art that is being revived. The use of natural ingredients in perfumery is much healthier for the environment and our own wellbeing. People with allergies, who can’t have the hormone disrupting chemicals of synthetic perfumes or simply can’t tolerate the strong smells of some synthetic fragrances are so pleased to be able to wear a natural perfume that doesn’t react with them. In the 1800’s famous French Perfumer, G.W. Septimus Piesse was the first to use top, middle and base notes of music as an analogy to constructing perfume. These French Perfumery techniques are the perfect harmony of top, middle and base notes to a produce a beautiful blended harmony of fragrances and are the methods used by Cherie Em using only natural and organic aromatic materials. 100% Pure Essential Oils for product making and natural perfumery. Cherie Em also supplies 100% pure aromatherapy oils in store and soon to be online along with workshops for those wishing to purchase some of the finest botanical ingredients in the world. 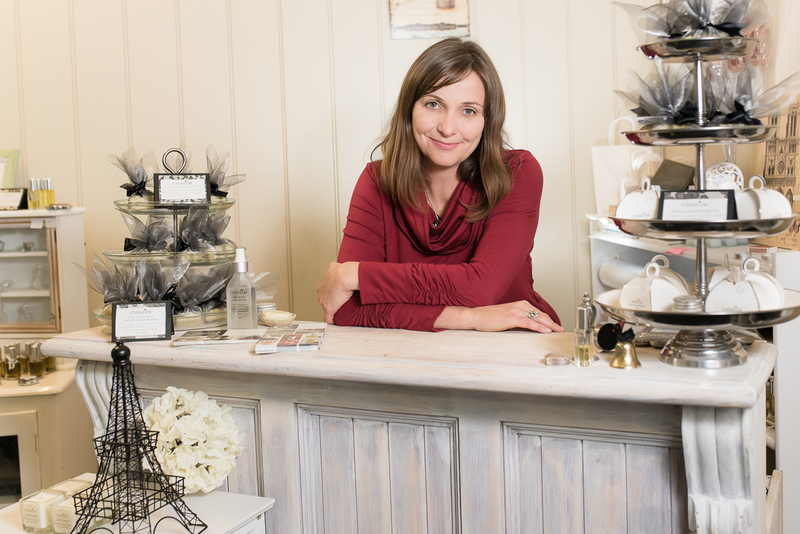 Cherie has 15 years experience in sourcing and assessing quality essential oils and is looking forward to bringing you a wide range of the highest quality aromatherapy and natural perfumery supplies.